It is Ligonier's desire to serve the church in fulfilling the Great Commission. This survey has helped to point out common gaps in theological knowledge and awareness so that Christians might be more effective in the proclamation, teaching, and defense of the essential truths of the Christian faith. View the infographic [pictured at right], listen to Dr. R.C. Sproul discuss these findings on Renewing Your Mind, or download the official white paper and survey with key findings. Ligonier Ministries is “committed to faithfully presenting the unvarnished truth of Scripture to help people grow in their knowledge of God and His holiness.” Anecdotal evidence has shown an increasing lack of theological understanding in America, both outside and inside the church. Ligonier Ministries wanted to understand with accuracy the extent of the need to improve that understanding. Ligonier Ministries commissioned a research study by LifeWay Research to measure the theological awareness of adult Americans. Ligonier Ministries identified specific doctrines and heresies that they wanted to test. LifeWay Research helped refine these questions and to conduct a survey of 3,000 Americans. Questions focused on seven key doctrinal areas and included a number of specific areas where Americans differ from historic and orthodox views. The key doctrinal areas covered by the study include beliefs about God, beliefs about goodness and sin, beliefs about salvation and religious texts, beliefs about heaven and hell, beliefs about the church, and beliefs about authority. For those of us who are devoted to the Scriptures as our ultimate authority, who care about a correct understanding of truth, and who therefore have been paying particular attention to the disintegration of our culture and the deplorable state of professing Evangelical Christianity, many of the survey's finding will come as no surprise. However, some of the findings might surprise you, especially when the views of those identified as Evangelical Protestants are compared to the common views of Americans who are not Evangelical Protestants. For example, 64% of Americans surveyed agreed with the statement that "A person obtains peace with God by first taking the initiative to seek God & then God responds with grace" (which is not surprising), but 68% of those identified as Evangelical Protestants also agreed with the statement (which I find a bit surprising, given that even an Arminian should no better). At any rate, I thought the readers of this blog would find the study both interesting and helpful. Feel free to let us know what you think. Note: As with most of the the other outlines I have posted on this blog, this expositional outline was originally used for teaching on a Sunday morning at Immanuel Baptist Church, where I have been blessed to serve as the primary teaching elder for more than twenty years. This outline is yet another sample of the kind of expository teaching to which we Reformed Baptist pastors are committed and about which we are so passionate. If you wish to hear the audio of the teaching from back in 2012, you can listen here. Introduction: What measures did you take to prepare your heart before you came here this morning to worship the Lord? Did you spend time in prayer about it last night? Did you pray about it when you woke up this morning? Did you perhaps sing or listen to worship songs at home or in the car on the way here? Or did you do nothing in particular? If not, then I encourage you to pay special attention to this morning's teaching, for we will see that David thought it was very important to prepare our hearts as we come together as a community of believers to worship the Lord. It is my hope that we will all learn from him today more about how we ought to come before the Lord in worship. Notice first of all that this psalm has a title: “A Song of Ascents. Of David.” The Songs of Ascents are made up of Psalms 120-134. These fifteen Psalms were apparently written to be sung by the people of the Lord as they went up to the Temple in Jerusalem to worship. They may therefore be regarded as songs designed to prepare the hearts of the people for worship in the Temple. As we shall see in Psalm 133, this meant that the people were prepared for worship only if they recognized the blessing and importance of doing so as a part of a community of the faithful. With this in mind, let's turn our attention now to verse 1. NKJ Psalm 133:1 Behold [הִנֵּה, hinnēh], how good and how pleasant it is for brethren [אָח, āḥ] to dwell together in unity! It is a wonder seldom seen, therefore behold it! It may be seen, for it is the characteristic of real saints, therefore fail not to inspect it! It is well worthy of admiration; pause and gaze upon it! It will charm you into imitation, therefore note it well! God looks on with approval, therefore consider it with attention. (Treasury of David, e-Sword). NKJ Deuteronomy 15:1-3 At the end of every seven years you shall grant a release of debts. 2 And this is the form of the release: Every creditor who has lent anything to his neighbor shall release it; he shall not require it of his neighbor or his brother, because it is called the LORD's release. 3 Of a foreigner you may require it; but you shall give up your claim to what is owed by your brother [אָח, āḥ] …. NKJ Deuteronomy 15:12 If your brother [אָח, āḥ], a Hebrew man, or a Hebrew woman, is sold to you and serves you six years, then in the seventh year you shall let him go free from you. Again we see that a fellow Israelite is regarded as a “brother” even if he is of inferior social standing, in this case even if he is a slave. NKJ Deuteronomy 25:1-3 If there is a dispute between men, and they come to court, that the judges may judge them, and they justify the righteous and condemn the wicked, 2 then it shall be, if the wicked man deserves to be beaten, that the judge will cause him to lie down and be beaten in his presence, according to his guilt, with a certain number of blows. 3 Forty blows he may give him and no more, lest he should exceed this and beat him with many blows above these, and your brother [אָח, āḥ] be humiliated in your sight. Notice in this case that a fellow Israelite is to be regarded as a “brother” even if he has offended you and deserves to be punished. And because he is your brother you should want to be merciful to him even if you have to inflict punishment upon him. Thus we have seen that the Old Testament usage of the term brother could refer not just to one's immediate family, but to anyone who is a fellow Israelite. However, I would argue that David's usage of the term here, while similarly broader than simply one's own immediate family, is nevertheless restricted to only some other Israelites, namely those who are like-minded in their commitment to the Lord. For in this context David has in mind all of those who come together to worship the Lord, no matter who they are. He is speaking, then, of the community of the faithful as though they are themselves a family, a spiritual family, if you will. Remember that this is a “Song of Ascents,” intended to be sung by the faithful who travel to Jerusalem and go up to the Temple to worship. So, when David refers to the “brethren” in verse 1, he means all those who come to worship God together, no matter who they are – no matter what their social or economic standing (Deut. 15:3,12), and no matter whether or not they may have offended you at some point (Deut. 25:3). 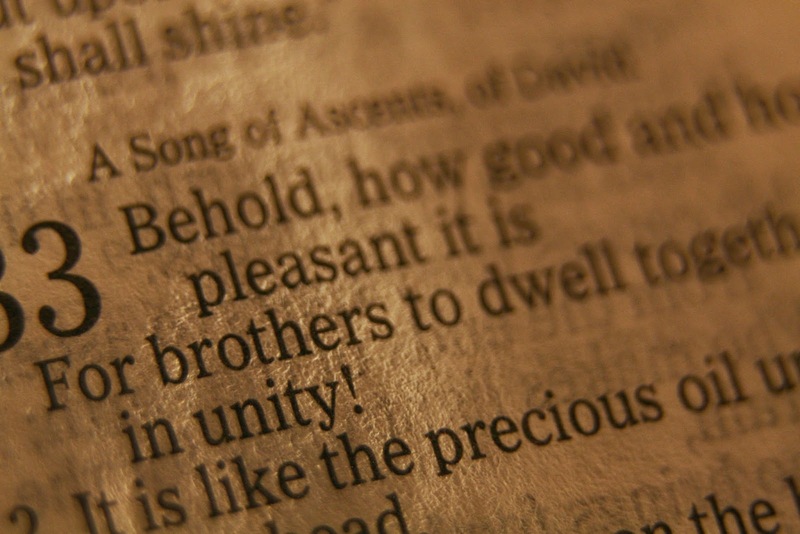 But, although David wrote this Psalm to be sung as one ascended up to Jerusalem and to the Temple to worship, and in order to describe the unity of such people, he clearly intends that the unity expressed as they worship together should also be present in the totality of their lives as they “dwell together” – or live together – in the land. Otherwise, they could not sing this song with sincerity when they came to worship. NKJ Matthew 5:23-24 Therefore if you bring your gift to the altar, and there remember that your brother has something against you, 24 leave your gift there before the altar, and go your way. First be reconciled to your brother, and then come and offer your gift. Jesus clearly assumes that we cannot truly worship the Lord if there is a problem in our relationship with a brother, if there is a sin that has not been reconciled. Thus we may see that because of our sins we may often have obstacles to unity. We too experience many obstacles to genuine worship, don't we? For example, we also have to travel to worship the Lord together on Sunday morning, and there may be any number of distractions as we travel, ranging from bad drivers on the road, unexpected delays, cranky children in the back seat, a cold shoulder from a spouse that we should have told we were sorry for something we said or did the night before, the sudden reminder of a problem at work, and so on. But despite such obstacles, the Lord would have us remember “how good and how pleasant” it is for us to live together in unity with our spiritual brothers and sisters. This will help to motivate us to put things right with others before we come to worship Him. It will help us to remember that we must not only love God with all our heart, but that we cannot really do so if we do not also love our brother. However, we might be thinking about how hard this is, and we might be wondering how on earth we could ever come consistently before the Lord with such love and unity between us. Well, David points us to the answer in the next two verses, where he reminds us of the fact that such unity is first and foremost a blessing that comes from God. NKJ Psalm 133:2 It is like the precious oil upon the head, running down [יָרַד, yāraḏ] on the beard, the beard of Aaron, running down [יָרַד, yāraḏ] on the edge of his garments. So, we see that, in comparing the goodness and pleasantness of unity between believers to the precious anointing oil, David pictures this unity as something that is special, valuable, unique, giving off a sweet aroma – i.e. creating a pleasant atmosphere around us – and, above all, he pictures such unity as something that is holy. This oil signifies that which is precious to God. And the anointing of Aaron with this oil signified God's special blessing upon him. David also describes this oil as “running down” Aaron's beard and his garments. So, he wishes for us to see our unity not only as a special sign of God's blessing, but as a sign of His blessing poured out in abundance. NKJ Psalm 133:3 It is like the dew of Hermon, descending [יָרַד, yāraḏ] upon the mountains of Zion; for there the LORD commanded the blessing -- Life forevermore. David describes the unity of God's people as they live and worship together as though the dew of Hermon had descended upon Zion. He thus pictures God's people living and worshiping together in unity as something that is so refreshing that it is as though God had caused the dew of Hermon to fall upon Jerusalem. By ending with a focus on the ultimate blessing of God – everlasting life – as something experienced in unity with God's people, David emphasizes a very important fact that too many do not understand in the Church, namely that we are not fully experiencing the joy of the life we have from God if we are not experiencing it together! Where there is not real unity among believers, there is lacking also a full expression of the life of the age to come in the here and now! NKJ Romans 14:13-19 Therefore let us not judge one another anymore, but rather resolve this, not to put a stumbling block or a cause to fall in our brother's way. 14 I know and am convinced by the Lord Jesus that there is nothing unclean of itself; but to him who considers anything to be unclean, to him it is unclean. 15 Yet if your brother is grieved because of your food, you are no longer walking in love. Do not destroy with your food the one for whom Christ died. 16 Therefore do not let your good be spoken of as evil; 17 for the kingdom of God is not eating and drinking, but righteousness and peace and joy in the Holy Spirit. 18 For he who serves Christ in these things is acceptable to God and approved by men. 19 Therefore let us pursue the things which make for peace and the things by which one may edify another. NKJ John 15:9-12 As the Father loved Me, I also have loved you; abide in My love. 10 If you keep My commandments, you will abide in My love, just as I have kept My Father's commandments and abide in His love. 11 These things I have spoken to you, that My joy may remain in you, and that your joy may be full. 12 This is My commandment, that you love one another as I have loved you. NKJ 1 John 4:20-21 If someone says, “I love God,” and hates his brother, he is a liar; for he who does not love his brother whom he has seen, how can he love God whom he has not seen? 21 And this commandment we have from Him: that he who loves God must love his brother also. RNS appears to have done a thorough and fair job of reporting on this issue, and the articles linked should put things in perspective as far as the order of events and basic issues are involved. It is sad to see such a failure, but it is not altogether unexpected when a man begins his ministry as a maverick who was unqualified to pastor when he first took on the task anyway. Let us all learn from this just how important it is not to put a novice into pastoral ministry and then proceed to enable him for years simply because he becomes popular. Warren Throckmorton, who has been one of the writes who has broken many parts of the story concerning the saga of Mars Hill Church and Mark Driscoll, issued the following report on October 19: Mars Hill Church Board of Elders: Mark Driscoll Resigned Instead of Entering a Restoration Plan. At this point, who among us could really be surprised? Following much prayer and lengthy discussion with Mars Hill’s leadership, the board of Mars Hill has concluded that rather than remaining a centralized multi-site church with video-led teaching distributed to multiple locations, the best future for each of our existing local churches is for them to become autonomous self-governed entities. This means that each of our locations has an opportunity to become a new church, rooted in the best of what Mars Hill has been in the past, and independently led and run by its own local elder teams. We recognize this reorganization plan is a significant and complex undertaking on many fronts; however, our goal is to have the process completed by January 1st, 2015. May the Lord give the leaders of this church wisdom to begin following His Word more closely in the future. 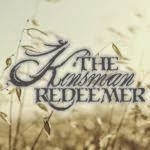 Note: The following is a teaching outline on Ruth 2:20, in which Boaz is described as a goël – a kinsman redeemer – which not only enabled him to become an ancestor of our Lord Jesus Christ but also enabled him to serve as a type of Christ as well. The law of redemption now comes into view. According to this law, the nearest male blood relative had the duty of preserving the family name and property. This duty could entail (a) avenging the death of a family member (Num. 35:19-21); (b) buying back family property that had been sold to pay debts (Lev. 25:25); (c) buying back a relative who had sold himself into slavery to pay debts (Lev. 25:47-49); and (d) marrying the widow of a deceased relative (Deut. 25:5-10). Notice that there are at least three conditions that must be in place if one is going to be helped by a goël: 1) The goël must be a kinsman, 2) he must possess the means to pay price of redemption, and 3) he must be willing to do so, for the text says that the kinsman may redeem his brother from slavery, not that he must do it. As we consider the way that God took up the metaphor of the goël and applied it to His own saving action in Christ, these factors will become important in our understanding of what He has done. But first we must see 1) how God described Himself as our Goël, 2) how He promised a Messiah who would be our Goël, and 3) how Jesus became our Goël in fulfillment of God's promise. Even so God describes His work as our Goël as a manifestation of His everlasting kindness toward us (Isa. 54:8), which led to His promise of salvation through Christ. And this brings us to the second point. And so we have found not only that the LORD repeatedly referred to Himself as our Goël, but that He also referred to the promised Messiah as our Goël. So let's turn our attention now to the last point. Remember that earlier we saw that there are at least three conditions that must be in place if one is going to be helped by a goël: 1) the goël must be a kinsman, 2) he must possess the means to pay price of redemption, and 3) he must be willing to do so. I would submit to you that all three of these conditions were met by our Lord Jesus Christ on our behalf. Conclusion: I hope that we have gained through this brief study a greater appreciation for how the LORD has acted to save us through His Son Jesus Christ. And I hope we have gained a greater appreciation for how the work of the goël Boaz– the kinsman redeemer – foreshadowed His saving work. New Find on Page button located next to the Search button on each view's toolbar. 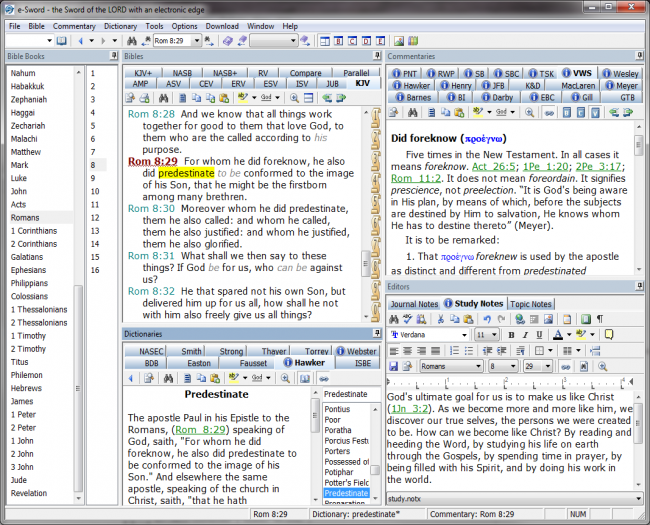 This Find feature makes locating content easier on large articles, such as those in many commentaries, dictionaries and reference books. New User Files Location field in the Resources dialog (under the Options menu) for customizing where you wish for your user files to be located. This is very convenient for setting up with backup or synchronizing programs, such as Dropbox. Initially these files will still default to your "My Documents\e-Sword\" directory, but now you can easily change that! Fixed Editor issue where it could possibly give a formatting error and not save the changes. Although a number of modules have been developed for purchase by eStudySource, the list of free modules grows daily. 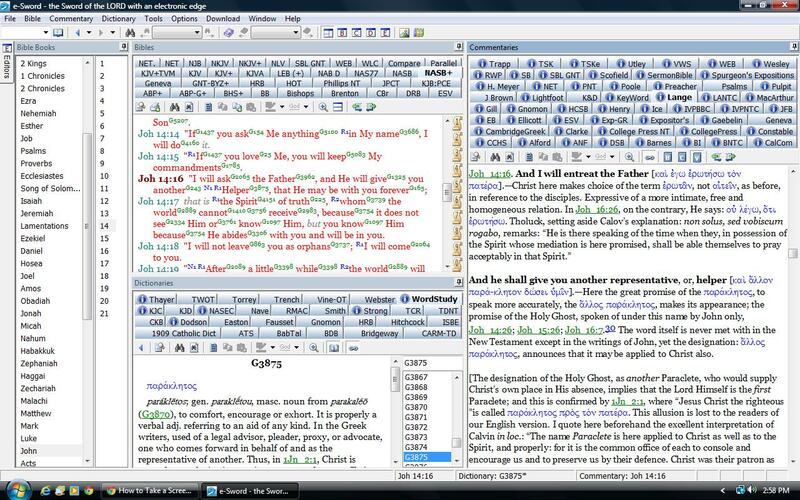 There are quite a few free modules already offered at the e-Sword downloads page, such as John Gill's Exposition of the Entire Bible, Matthew Henry's Commentary on the Whole Bible, the Keil & Delitzsch Commentary on the Old Testament, or A.T. Robertson's Word Pictures in the New Testament. This list has grown steadily over the years. There is also a growing list of free modules available at BibleSupport.com, about which I have previously posted here. Click on the screenshot in order to enlarge it, and you can see that I have purchased a few modules but also that I have many modules that I have downloaded for free from BibleSupport.com.